The TP4 Thermopak is a 5kVA power supply unit. It includes a heavy duty voltage step-down transformer which converts the mains supply to a very low voltage, as required for resistance soldering and brazing, but with a secondary capable of carrying a high current. The TP4 has a 24V supply for the controls ensuring that the equipment is safe for the operator to use. In addition an earthed screen is between the primary and secondary windings of the heavy duty transformer. 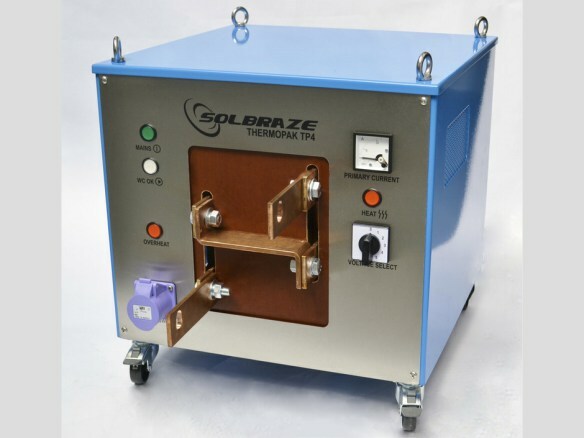 This unit is designed to be used with the larger sized Thermotools or resistance heads and for heavy use can be used with a water-cooled Thermotool such as the HD3W Thermotool. As part of the safety features on the TP4 a transformer current overload switch is fitted which will trip out if too much current being drawn. This protects the Thermopak as well as the electrical supply of the facility. A further safety feature is a transformer overheat cut out circuit that ensures that the transformer does not overheat, causing transformer hotspots, which can shorten the life of the transformer. Should the water-cooler need to be used with the TP4 a safety circuit will ensure that if there is no water pressure present the unit will not function. This is to ensure that if the watercooler has stopped cooling the resistance head or tool then these items will not overheat causing a potential safety hazard. There is a manual override switch fitted.